Does a Club Newsletter Item Count as Being Published? I’ve been a member of the 70+ year old El Paso Cactus and Rock Club for at least ten years. Some time ago, we hosted the club meeting to show off the work we had done on our back yard, including cactus landscaping and a brick patio. I remembered I had a Prickly Pear Cookbook on the shelf and decided it would be fun to do a cactus oriented luncheon. Every dish included prickly pear cactus in it in some form or another. When the club started an annual public program for Cactus Appreciation Month, I was invited to do cactus cooking demonstrations. My cooking style is cactus dishes that are more modern than traditional. 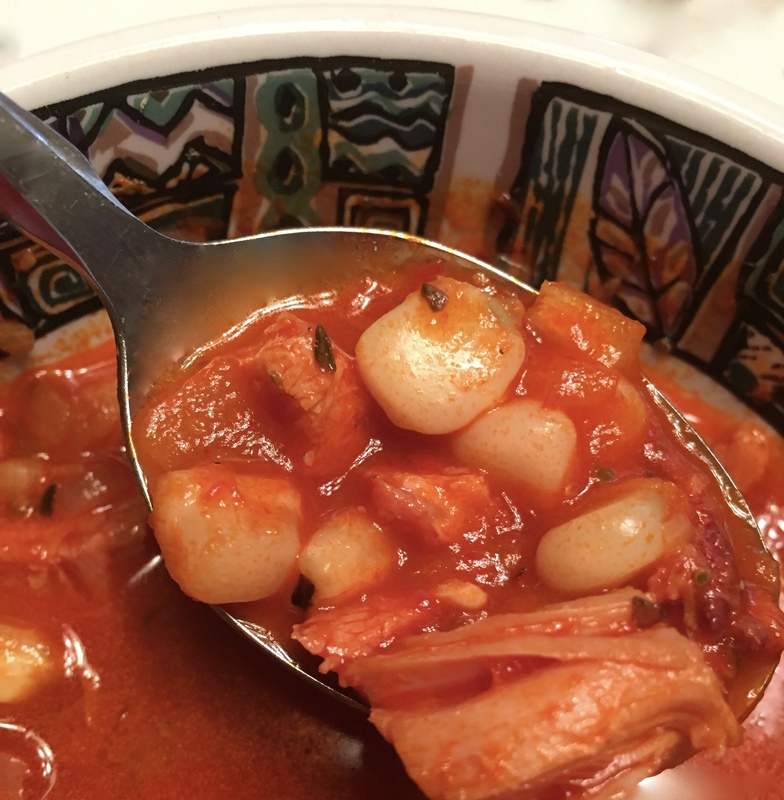 I have some cookbooks from authors in Arizona who make very exciting dishes featuring prickly pear pads and fruits and flower buds from cholla cactus and many more foods from native plants. I’ve learned from them and have created a few recipes of my own. 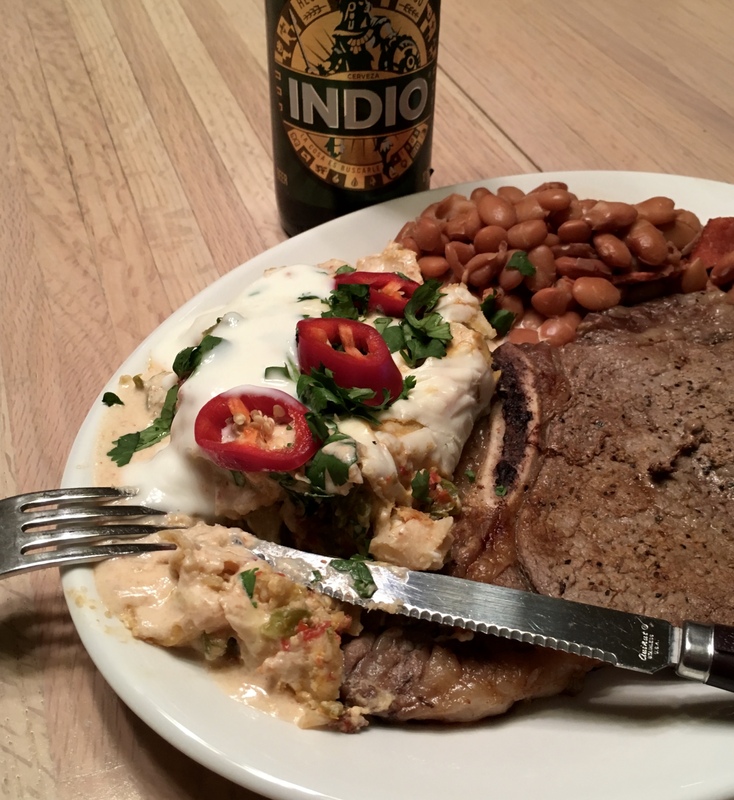 I say this way of cooking is “estilo Gringo” – Gringo style. 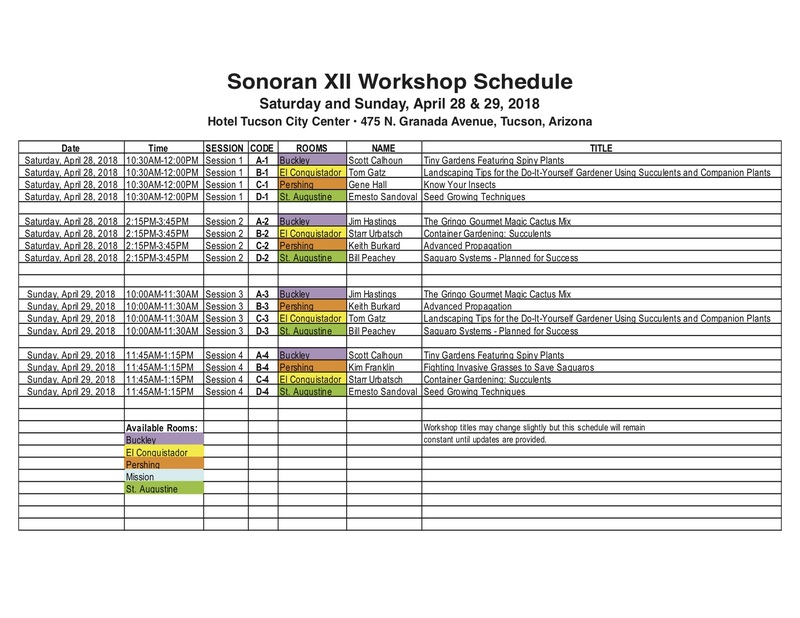 I am happy to say I’ve developed a reputation and have done demonstrations and classes in Texas, New Mexico and Arizona. I have become the Gringo Gourmet My daughter built the Gringo Gourmet blog site for me for Christmas in 2013. I enjoy writing the blog and shooting the food photos. I even get some reader hits on the site! Of course it doesn’t hurt that I post food pix on FaceBook with a link to the blog. This long winded introduction leads to my being asked to provide a recipe and photo(s) for the El Paso Cactus and Rock Club quarterly news letter. I try to come up with something original for each issue and have fun inventing recipes and doing amateur food-styling for the newsletter. I also come up with new ideas for my demo dishes that way. The next issue will feature what I consider the most difficult meal to prepare – breakfast. I tend to think of breakfasts fit for a farm hand – biscuits and gravy, pancakes and waffles, sausages, toast, eggs over easy cooked in pan drippings. And of course there must be butter and a variety of jams, preserves and jellies on the table. I cannot conceive of a green smoothie for my breakfast! Once or twice a year I fix what we called “big breakfast” in the good old days. The rest of the time, we try to enjoy more healthy fare and pretty much succeed. It still can be a challenge to make a country boy really want a healthy breakfast. 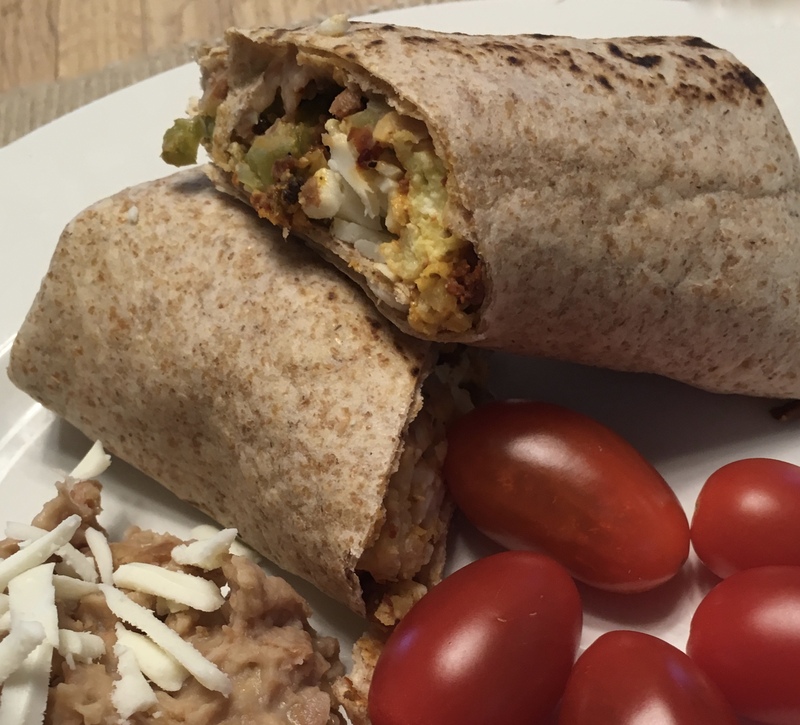 For the next Cactus Club Newsletter, I wanted to do a Gringo Gourmet more healthy twist on a Mexican egg and chorizo burrito breakfast. I’ve added prickly pear cactus the mix and serve it in a flour tortilla. First Gringo twist – I chopped about half a pound of prickly pear paddles into a half-inch dice. 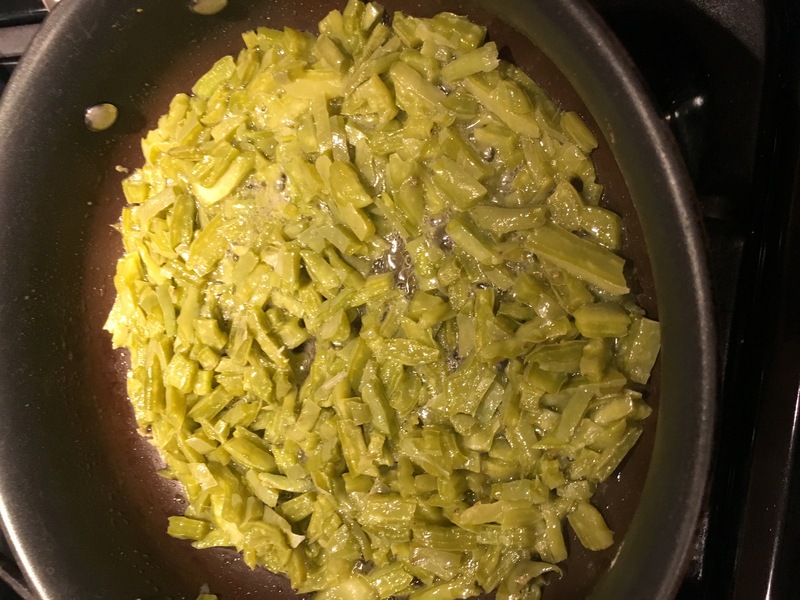 I cooked the cactus in about two teaspoons of canola oil. The cactus released its mucousy okra-like sticky secretion. I added a tablespoon of water at a time to the pan which created steam that helped evaporate away the sticky stuff. 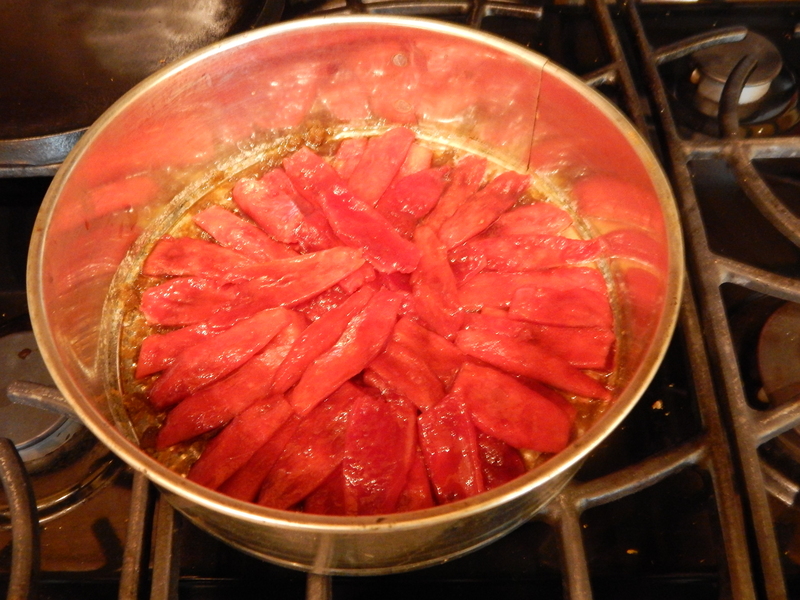 Diced prickly pear cactus pads simmering in the pan. Second Gringo twist – bulk chorizo sausage made fresh with ground pork at local markets. It is surprisingly lean and just as spicy and tasty as the mushed mystery meat plastic tubes labeled chorizo. I don’t mean to be crude, but I’m told that tube chorizo is made of ground lips and a**holes. I don’t want to visit a processing plant to find out if that is true. I’ll stick with ground real meat as the sausage base. 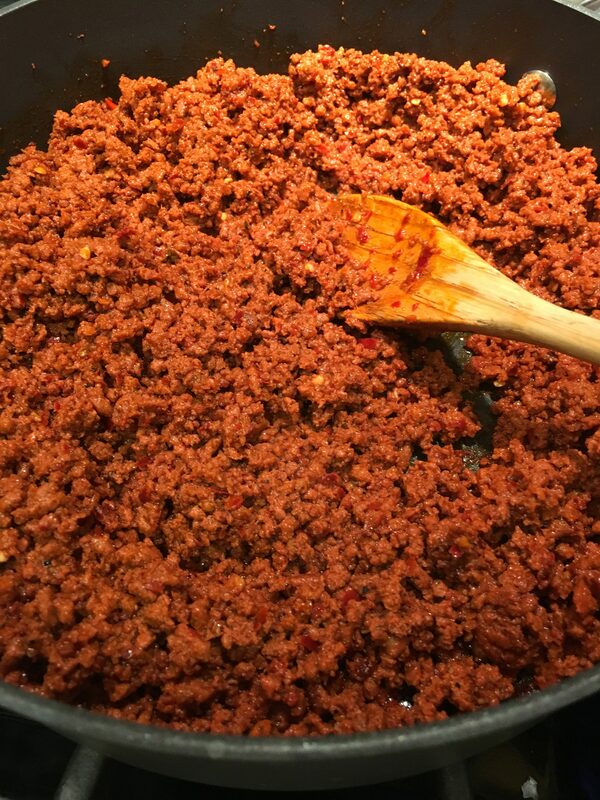 Ground pork with chorizo seasonings = bulk chorizo. Browned and crumbled and ready to be added to the cactus and eggs. I bought my market made chorizo and browned it with some chopped onion and garlic. There was minimal fat in the pan when it cooked. It was a texture similar to hamburger after been broken up and stirred in the pan. 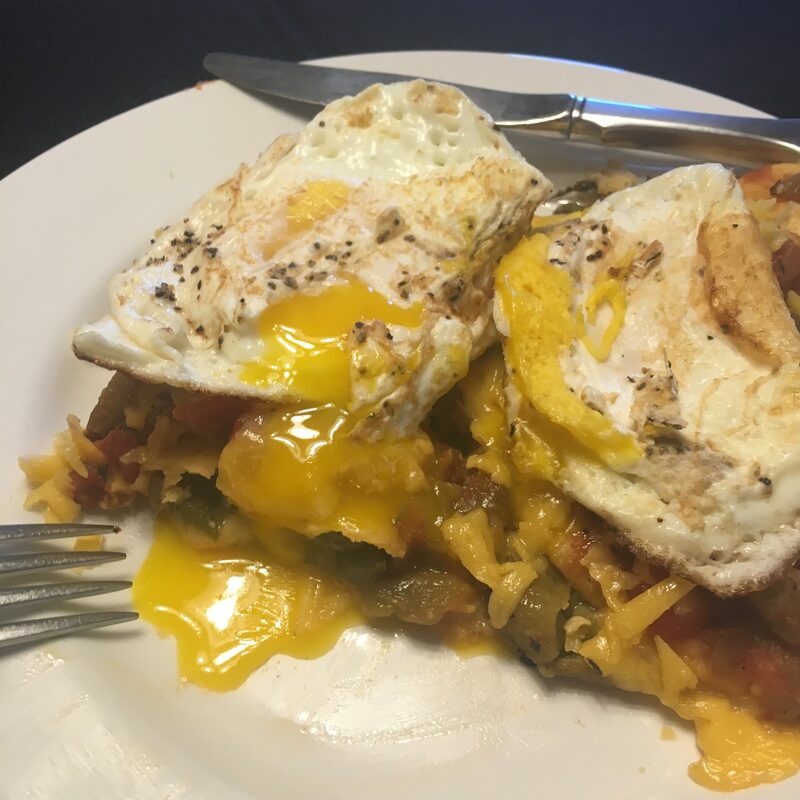 When the cactus was an Army green color I added four beaten eggs and swirled them until they began to firm up, then I started to stir them and made sure the cactus was well mixed in. Before they were too well set, I placed an estimated half cup of the cooked chorizo and stirred it into the eggs as they finished setting up. 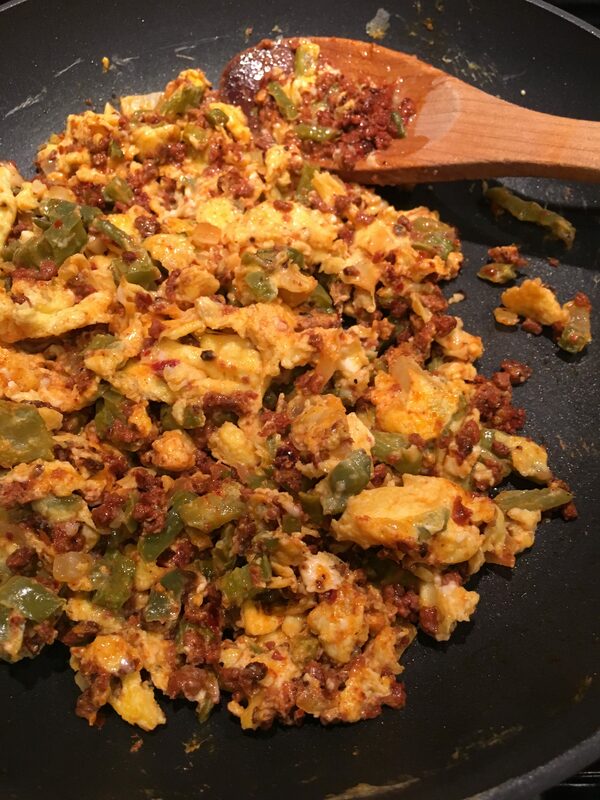 Cactus, chorizo and egg scrambled and ready for breakfast. I tried three different platings of the eggs and chorizo for the newsletter. 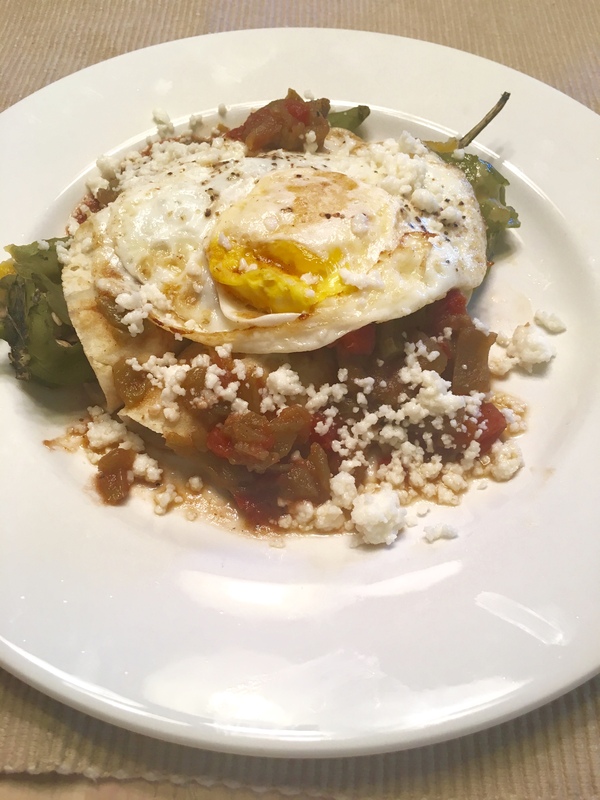 Each plating included the cactus, egg and sausage mixture, some refried beans and a handful of grape tomatoes for color and their special sweet-tart taste. First was a breakfast burrito made with a whole wheat tortilla. Please note that what I call a breakfast burrito would be called a breakfast taco east of the Pecos County line. Go figure that out. The second plating was three tacos. I softened the corn tortillas on a cast iron griddle until they were soft tender and had a little color. 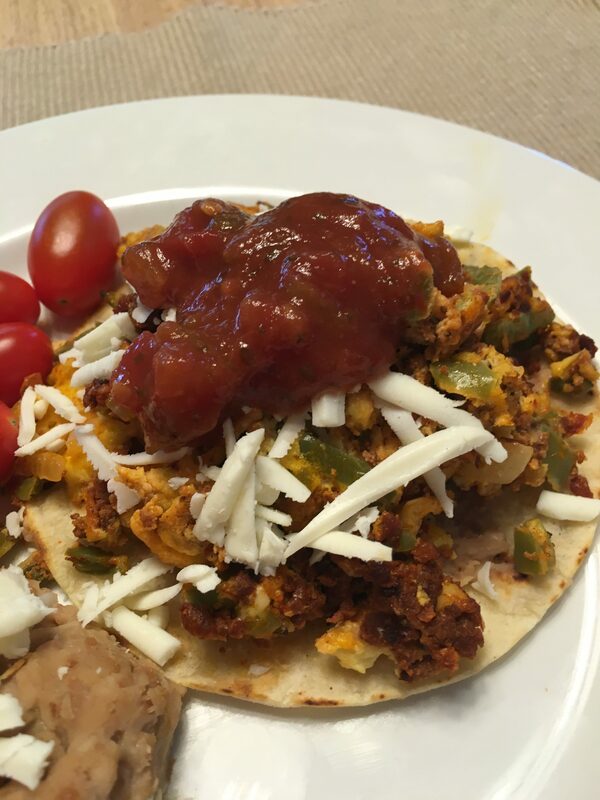 The final presentation was a griddle crisped flat corn tortilla topped with the egg and chorizo, some grated Mexican cotija cheese and a dollop of red chile salsa for a little extra kick. The three platings tasted pretty much the same. Their difference was the tortilla and prep of the corn tortillas. 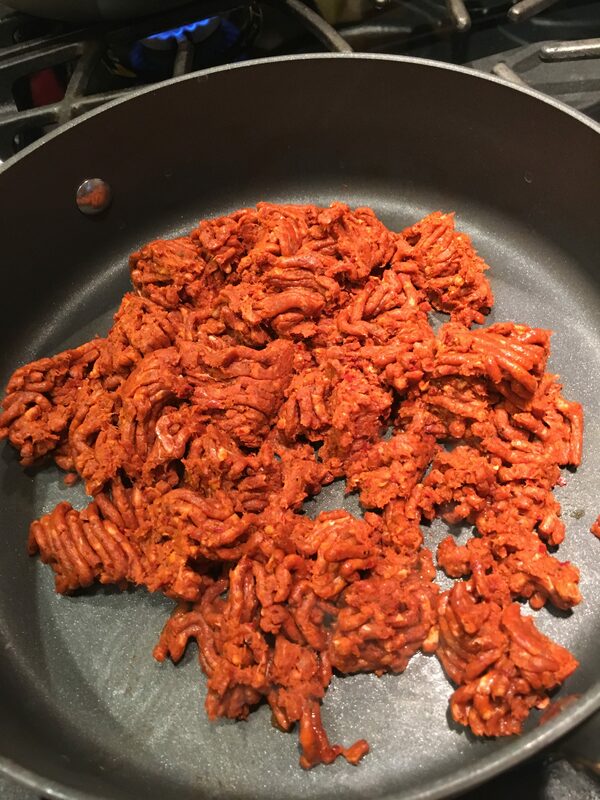 I do enjoy the bulk chorizo because I feel more like I know what is in it. That is important to me. 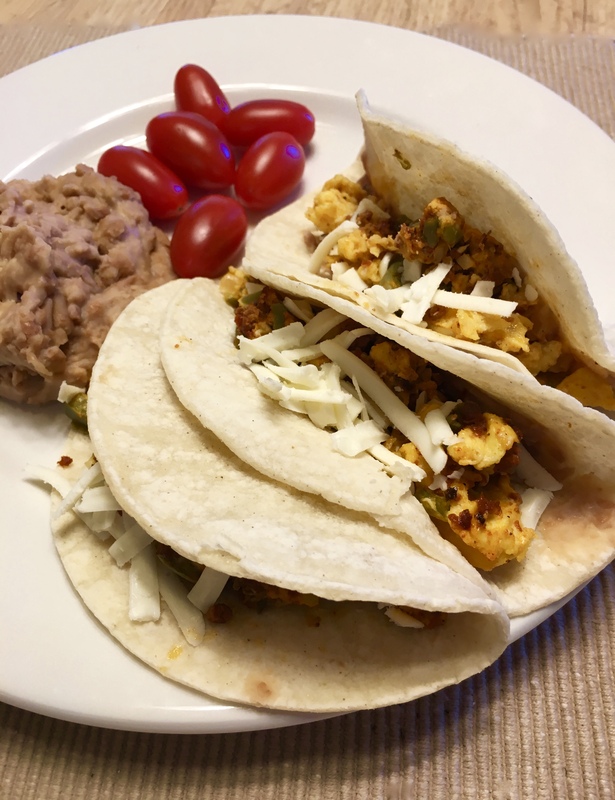 I’ve been researching chorizo recipes and next time I’ll buy ground pork and make my own. I’ll report on that when it happens. I had left over cooked chorizo in the fridge and decided to add it to stacked red enchiladas the way some cooks add hamburger to theirs. Of course, I had to have an egg on top since it was for breakfast. I liked the enchiladas with a runny egg yolk best of all. 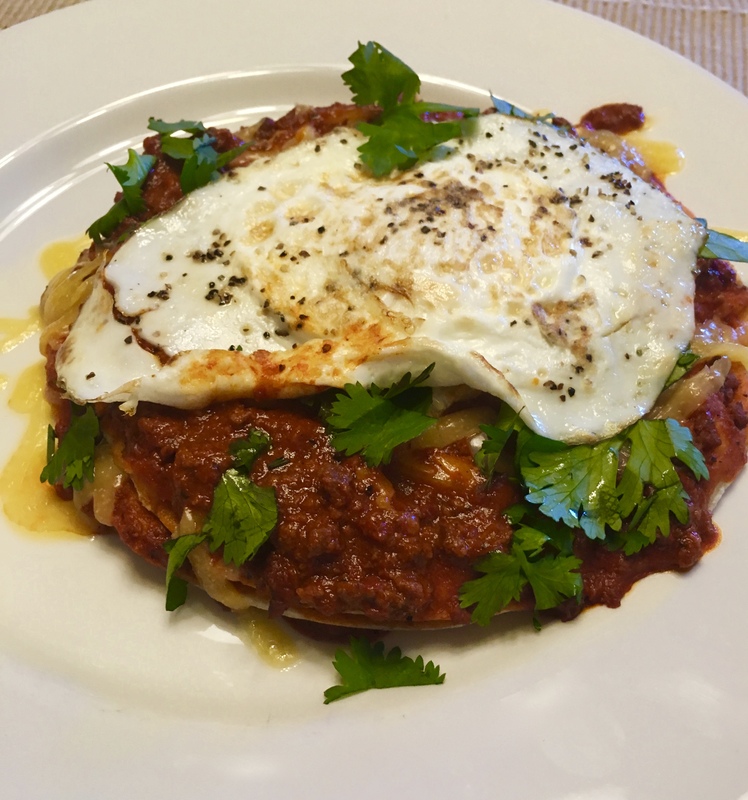 Enchiladas with chorizo and a runny egg. I may have to run out and buy some bulk chorizo before fixing dinner tonight! I am unashamedly addicted to chile. 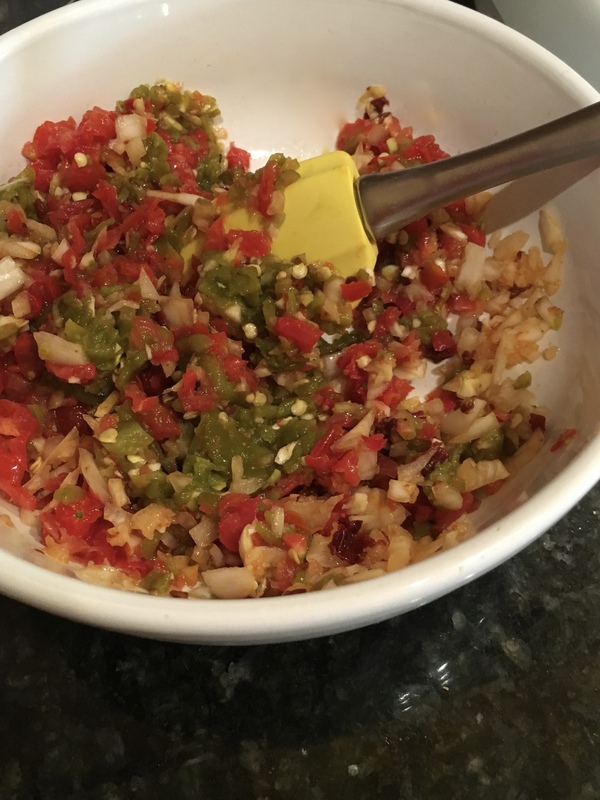 I crave green chile, red chile, hot chile, mild chile, just about any kind of chile and need a regular fix. The need is stronger than coffee craving some days. Today is one of those days. 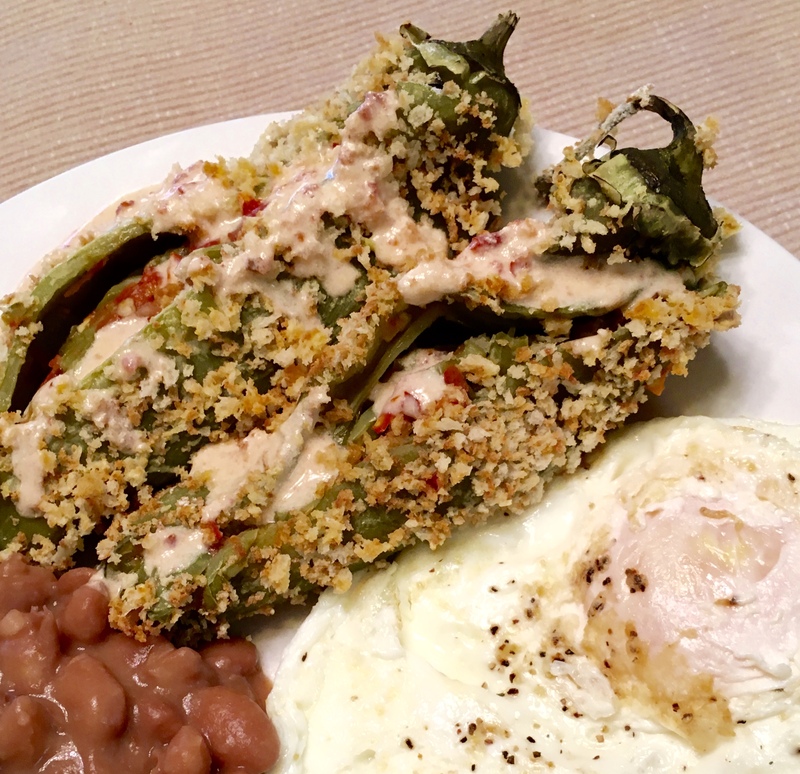 I woke up wanting chiles rellenos, but didn’t want to deal with the mess of stuffing, breading and frying or baking them. 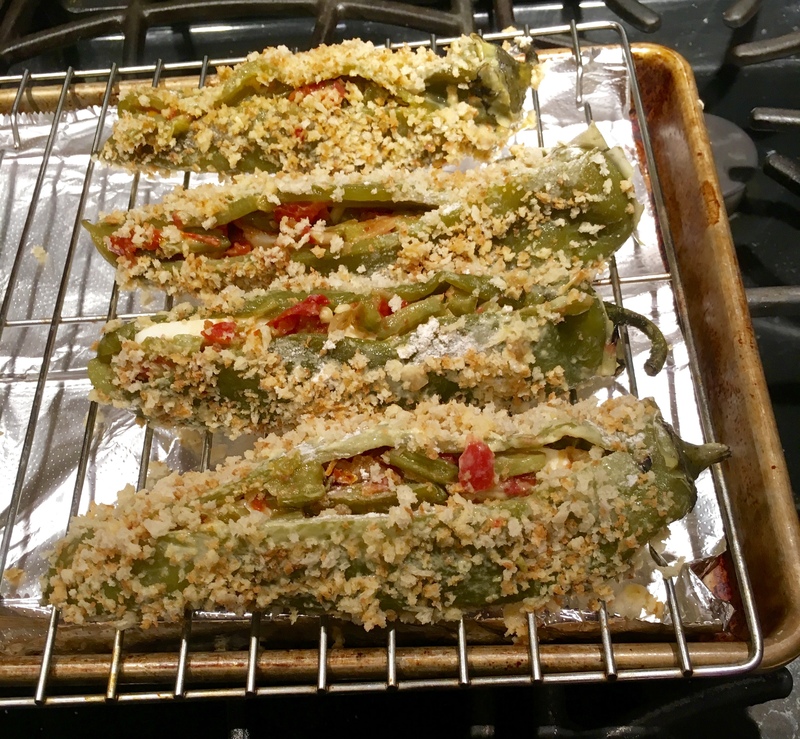 I’ve posted pictures of what I call chiles rellenos flojeros (lazy guy chile rellenos) which are simply cheese, and a green chile in a warm corn tortilla. That works, but didn’t sound quite right for a day that promises to be busy and long. 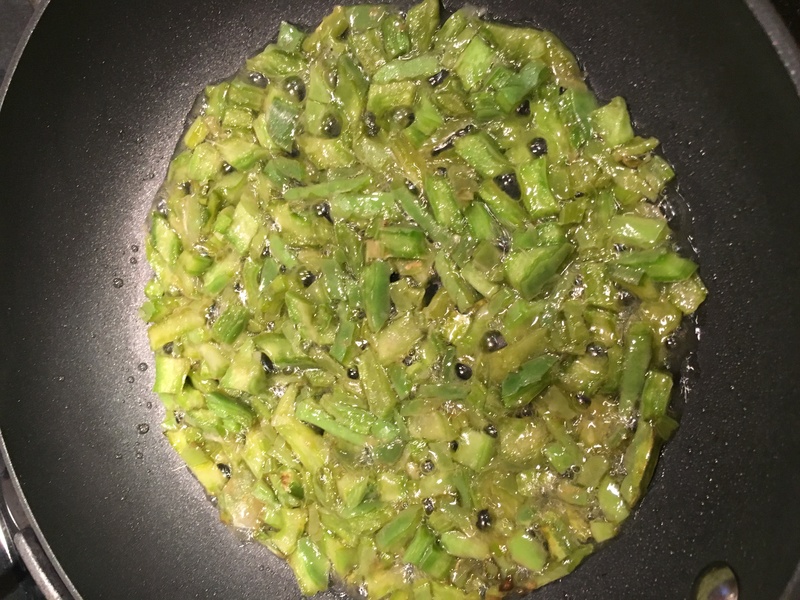 I decided to do a notched up version of rellenos flojeros by spritzing corn tortillas with olive oil and warming them in a skillet to give them a little texture and color. I buy roasted green chile almost every week, peel it and keep in the refrigerator for when those cravings hit. I cut a slit at the top of two chiles per serving and stuffed them with colby jack cheese. I left the stems on the chiles because I wanted them to be recognized as chiles in my photographs. They next went into the microwave for about a minute and a half to warm the chiles and melt the cheese. 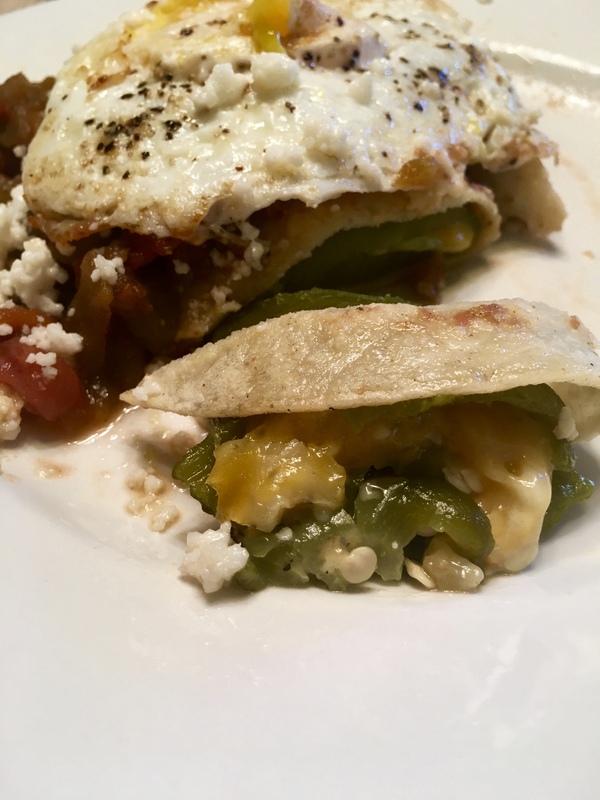 I folded the chiles in to my warm tortillas and placed two on a plate, added some warmed green chile sauce and topped them with an egg and a scattering of asadero cheese. 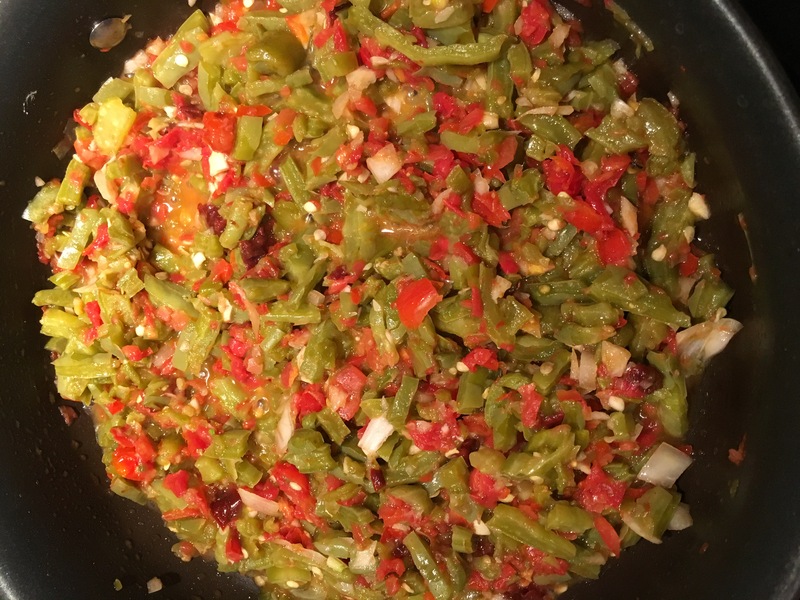 You might say they were “smothered” tacos, but since they were based on stuffed chiles, they are rellenos flojeros suaves to me (slick or swell lazy guy’s chiles rellenos). 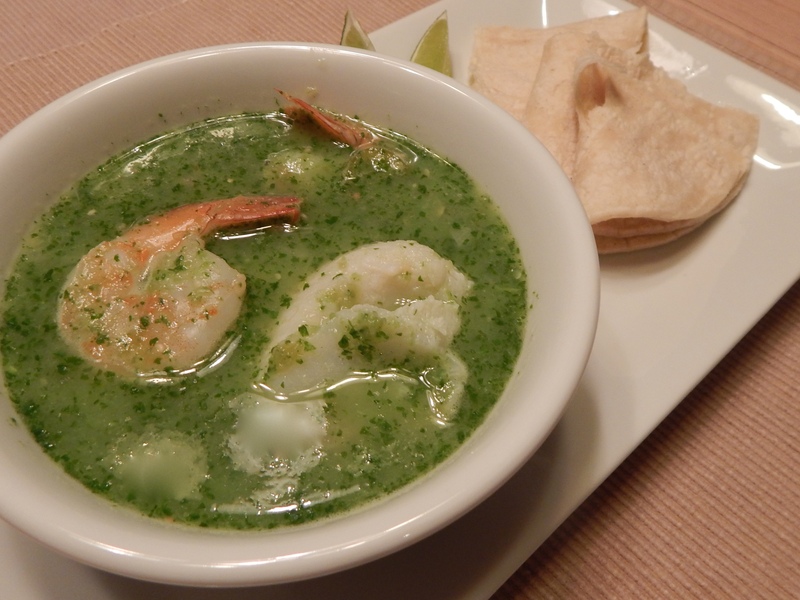 Whatever you might call them, they hit the spot and quelled that chile craving. Chiles rellenos flojeros suaves. Deliciosos! A closer view of a bite of stuffed chile in a tortilla. 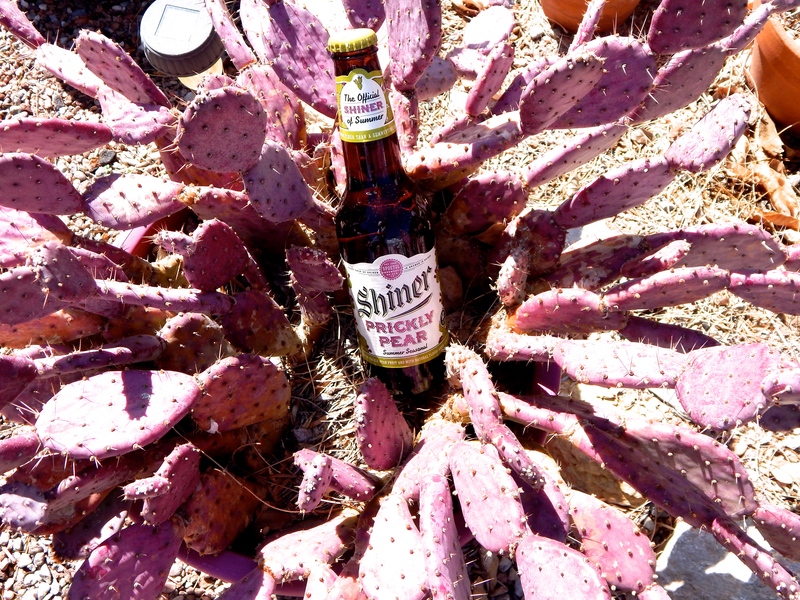 Shiner Prickly Pear Beer nestled in the Baby Rita prickly pear showing its purple/pink winter color. Challenges! 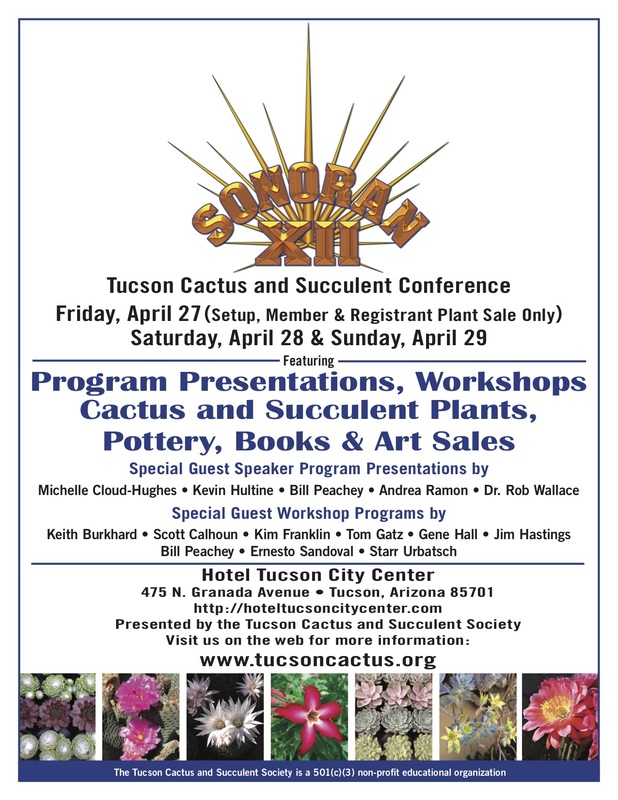 I’m doing a cactus cooking demo for a garden club later in the week. I enjoy doing programs for this particular club and want to do something special. 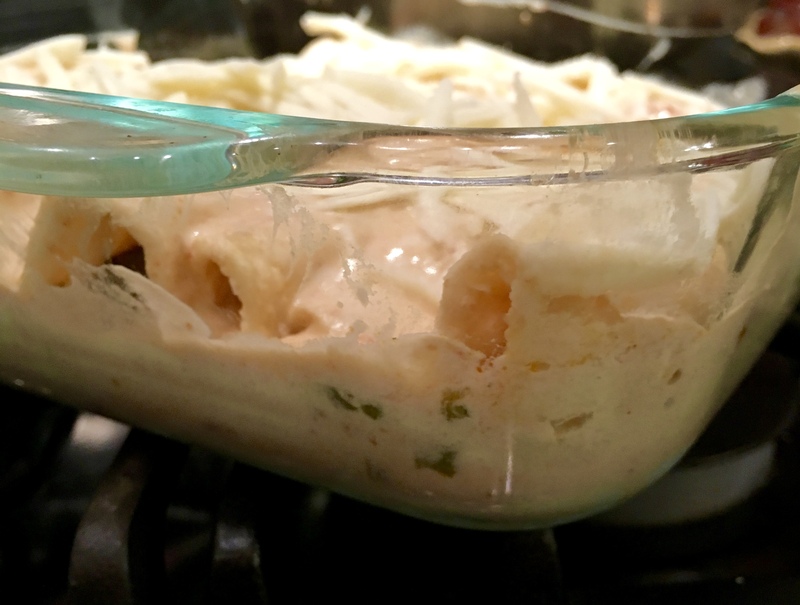 I’ve developed a recipe for cactus and green chile con queso bites that I cook as mini-muffins for tastings (see Feb. 27 post). They are very popular. 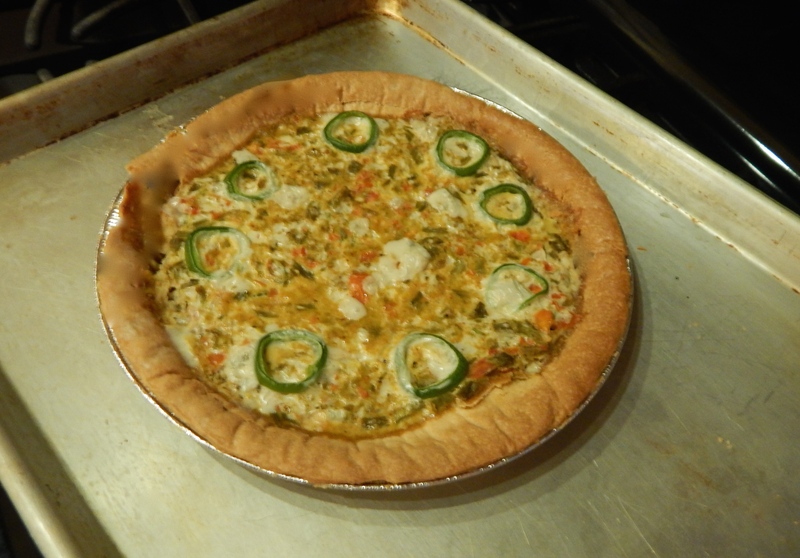 I wanted to use the recipe, but put it in a crust and serve it as a quiche. The challenge is, I’m not a baker and have never mastered the perfect pie crust. I decided to practice with a purchased (horrors!) crust. Then the adventure began. I over cooked the crust when I pre-baked it. It cracked and was a bit dry. I used a regular crust and had too much filling. I’ll use a deep dish crust for the actual demo. I am very happy to report that the filling worked well. It set up nicely in the pie crust. I had worried that it might be too wet and wouldn’t set well. It’s like the Cole Porter song, Experiment, and you’ll see. Its how we learn at the Gringo Gourmet Academy. The good news is my official taster and critic pronounced it delicious and ate three servings! Quiche trial right out of the oven. With little artful crust trimming, the crust experiment plates up well with a colorful salad. 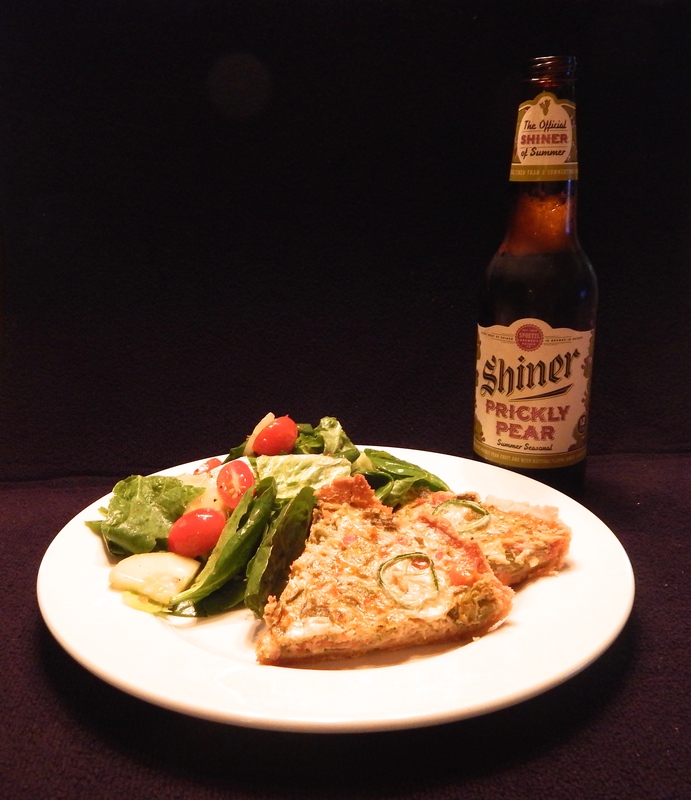 Part two of last night’s experience was tasting Spoetzl Brewery’s new summer seasonal release – Shiner Prickly Pear Beer. 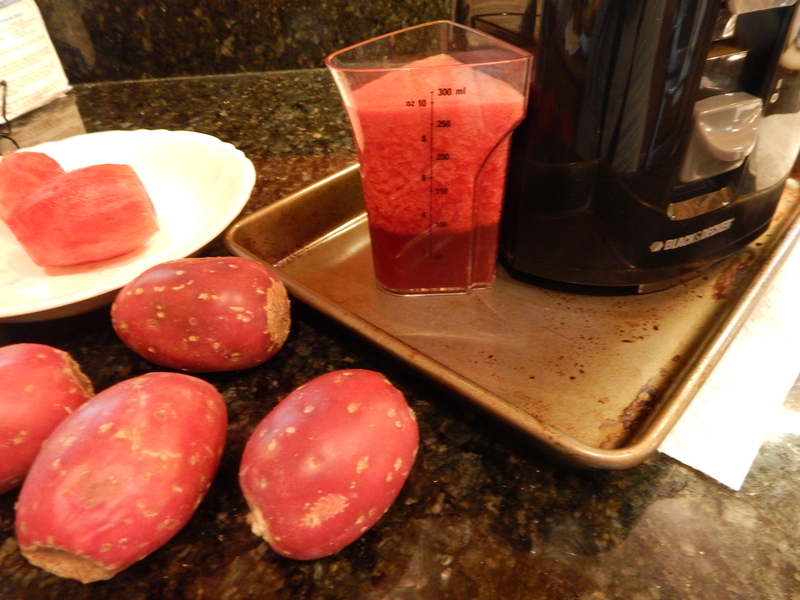 In my Gringo Gourmet persona, I’m all about prickly pear cactus and ways to use it. Of course I had to track down a prickly pear beer and give it a try. So you know up front, my favorite beer is Shiner Bock. I’m not a beer connoisseur, but I do enjoy a full bodied dark beer. Shiner Bock is my go to brew. Spoetzl’s Shiner Bohemian Black Lager is very high up on the list, too. Good, solid, very dark perfection. The prickly pear beer is a handsome reddish amber that is good to look at while enjoying the brew. 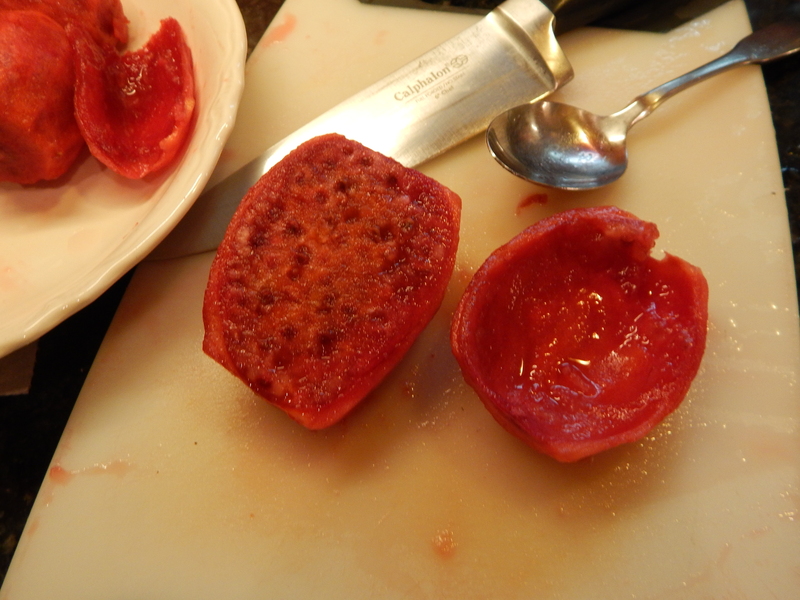 The most familiar of the prickly pear cactus fruit is a rich magenta color. 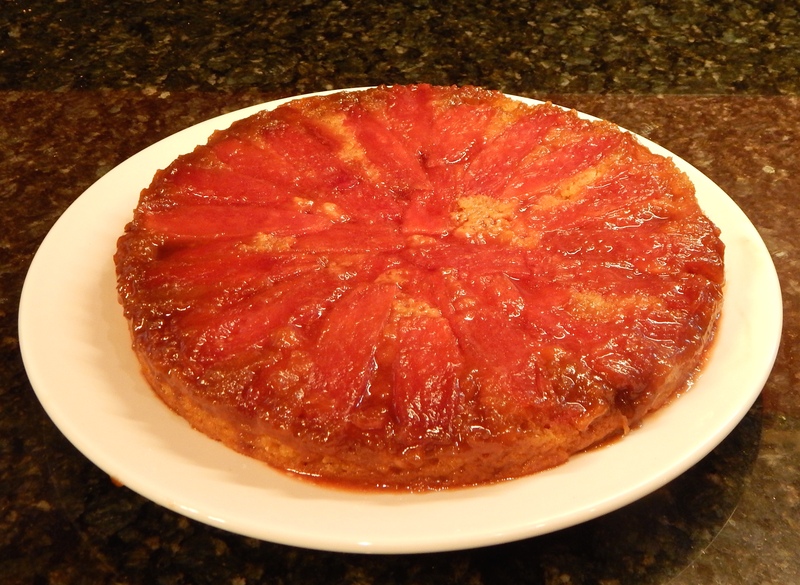 It has about 15% fructose and is a sweet treat by itself. It makes the beer a bit on the sweet side. 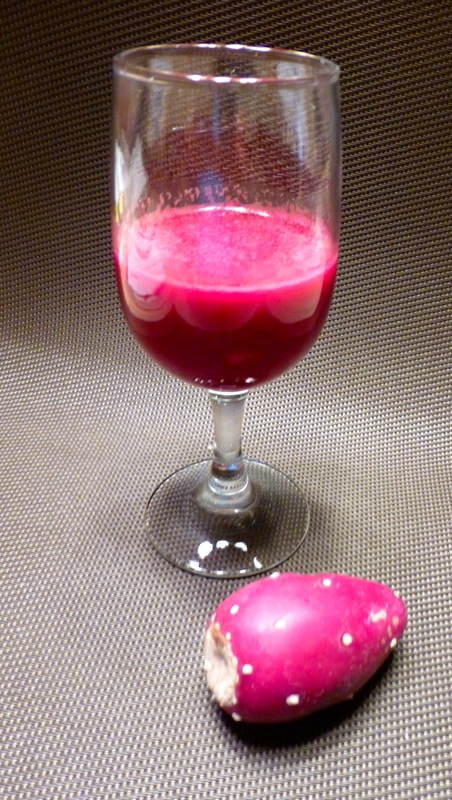 The beer is a beautiful red-amber color, thanks to the prickly pear fruit juice used in the brew. 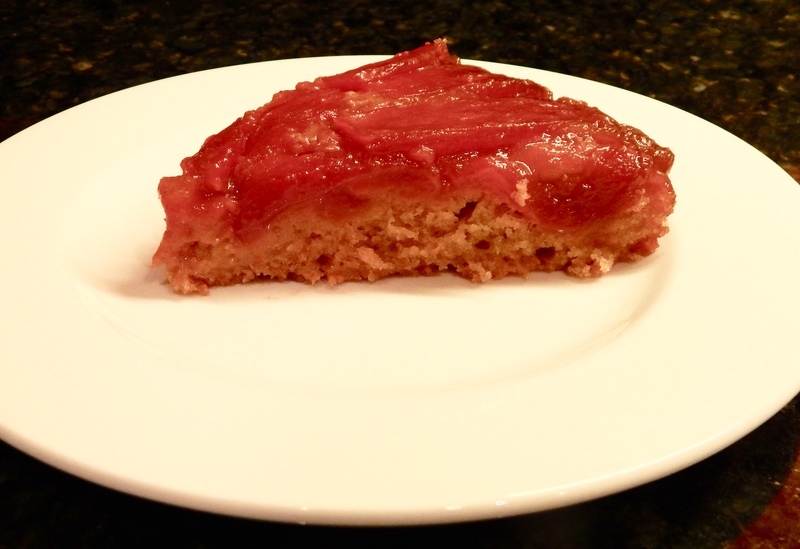 A prickly pear tuna and juice. What a color! Both the prickly pear pads and the fruit affect insulin levels in the blood stream. I’ll leave it to my scientist friends to figure out if that impact balances out the carbohydrates in the beer base of this brew. Prickly pear beer is a great sipping beer for a sunny afternoon. It was 77º yesterday afternoon when I conducted my tasting. I personally found it a little too sweet to serve with a meal. I’ll likely quaff a few more over the summer as a refresher during the hot days ahead. Do give it a try. You might also like their Ruby Redbird seasonal brew made with Texas Ruby Red Grapefruit. It, too, is taste treat you wouldn’t expect.